Pete Cosey’s name might not have been at the tip of everyone’s tongue, but if you owned any records on the Chess label from the late ’60s or dug your heels into any of Miles Davis’ grand wigouts, then chances are you are probably familiar with his handiwork. A sonic adventurer that boldly went where only a few dare tread, finding the continuity between Jazz, Funk and Psychedelic Rock and trailblazing his own pathway to the nether regions. Born in Chicago, Illinois, in 1943 and after living his teenage years in Phoenix, Arizona, Pete cut his teeth as a session player in the ’60s/early ’70s back in Chicago for Chess Records. He played on numerous sessions (often uncredited) by artists such as Etta James, Chuck Berry, Gene Ammons, Sonny Stitt, Rotary Connection and the polarized electric periods of both Howlin’ Wolf and Muddy Waters. Adding a surfeit of effects, including a wonderful preponderance of wah-wah/fuzz acrobatics, Pete managed to completely horrify blues purists in one fell swoop, and gather quite an audience of heads who would go on to champion his bold explorations in the years to come. Cosey was a truly inventive and original player who was obviously influenced by Hendrix’s stylings, but taking the proceedings into an almost unhinged free jazz territory akin to similar giant steps taken by fellow traveler Sonny Sharrock. He was an embryonic member of Chicago Afro Funk behemoths The Pharoahs who later became the seeds of Earth, Wind & Fire, as well as exploring some spiritual journeys with Philip Cohran. Pete is best remembered for the four albums he played on under Miles Davis’ solid-band leading hand: Get Up With It, Pangea, Agharta and Dark Magus. It is here and in such stellar company that his creative being was given the proper chance to flourish; often pushing the music (and perhaps) the musicians into fever pitch territory. After the breakup of the Miles band in 1975, Pete kept a relatively low profile, only rearing his head here and there in the years afterwards, most notably playing on the title track to Herbie Hancock’s Future Shock. On May 30, 2012 in Chicago, after complications with surgery, the world lost yet another major musical talent who really wasn’t given the proper credit of the true sonic pioneer he was. In my opinion, the success of any work of art is not measured by the amount of pretty words and blue ribbons which one can neatly hang upon it, but rather upon the number of return trips it inspires ‘to the sources.’ That’s what good art does: that’s its function. That’s what good music does as well. It inspires a missionary zeal compounded with a cartographer’s hate of blank spaces on a map. It invites obsession inside as a guest and sets an empty plate, sustaining itself solely on the deep resonance of the initial aesthetic shockwave. That’s what Robin Gibb’s music does and continues to do in me and thousands of others and, as such, this is not an obituary, a eulogy, a bike or a pipebomb. It’s a signpost and a sermon. Other things this is not. NOT an ephemeral by-the-numbers bio-piece. NOT a condescending blow-by-blow discographical romp or even an anatomical celebration of Robin’s heartbreaking voice: the most benign throat-lump inducer this side of Roy Orbison. Rather, it is a sticking to my original thesis and guns. Fine if you forgot it already. The best art and the best music compels one to track down and follow its influences, wind its tributaries, know its hidden places, swallow its bread-crumbs, know its markings. Like Lewis & Clarke or Columbus in reverse. However, the Beaux-arts also teach one to remain mindful of similar ripples, dispersions and fellow traveling waves dominoeing outward that, in turn, may carry new influences and sediment to add to the original. Perhaps the best piece of news of all for pilgrims set out upon these trails is that despite rumors of the frontier’s closure or hints that the promontory-peak of the sublime melting glacier of humanity’s divine input might already have been summited, take comfort in the fact that there always remains more to digest and explore. And don’t take my word for it; take the words of another great artist whose works are still moving. 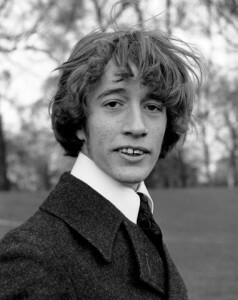 Robin Gibb will be missed. Here are some places that his music took me, both new and old. Roots, fruits and CM’s self-designated finest vocal by Robin follow. Use the arrow button on the lower-right portion of the YouTube box to scroll through the selections, or listen to them continuously by pressing play. Also find below an Ugly Things exclusive of Skooshny covering Robin’s “Saved by the Bell” which at this time goes unreleased. The Dillards at Hollywood High School, opening for the Byrds. 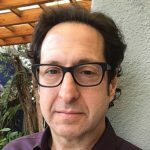 (Photo copyright: Lisa Law). From the ibook/Kindle edition of "Riot on Sunset Strip: Rock 'n' Roll's Last Stand in Hollywood." Banjo picker Doug Dillard came out to Los Angeles from his native Missouri with his brother Rodney, Dean Webb and Mitchell Jayne as the Dillards, and quickly helped to popularize bluegrass music as part of the LA Folk scene during the early ’60s at clubs like The Ash Grove, The Troubadour, The Ice House, The Mecca, The Golden Bear and others that made the city a freeway spread-out Greenwich Village of the West Coast. The Dillards were surrounded by a lot of great local bluegrass talent that would evolve into The Byrds ever-growing family tree: the Country Boys/Kentucky Colonels (with Clarence White), the Scottsville Squirrel Barkers and the Golden State Boys (both featured Chris Hillman, the latter featured Chris with Vern and Rex Gosdin). 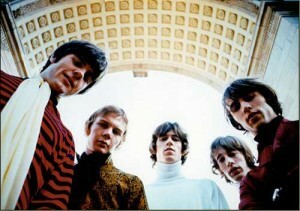 The Dillards were managed by Jim Dickson who would also come to manage the Byrds. 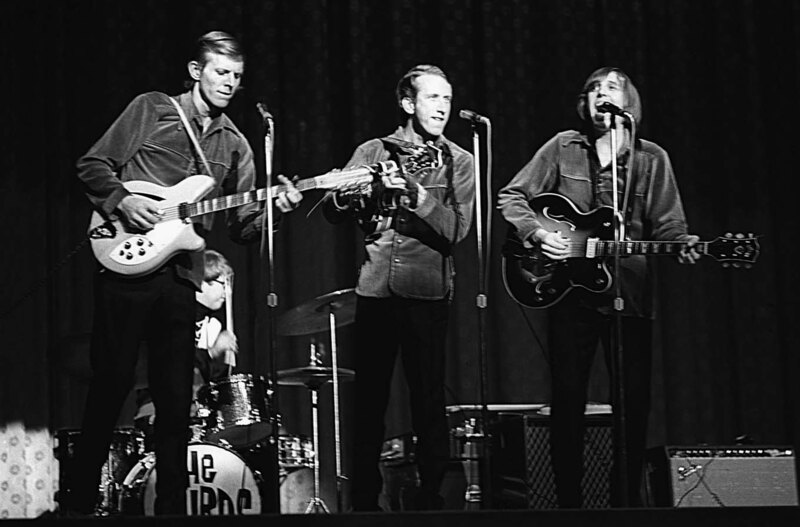 When the Dillards made the attempt to electrify in 1965, Jim hired Dewey Martin prior to his taking the drummer spot in Buffalo Springfield. This kind of interaction would play an incredible part in the growth of early Country Rock from its most core hill-bound element.